So in case you were unawares, Dale Coyne Racing has just unveiled Alex Lloyd’s Boy Scouts of America 100th Anniversary livery for this year’s Indy 500, as the No. 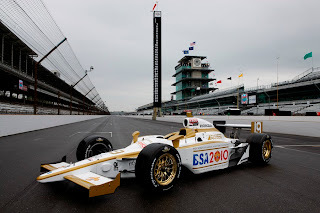 19 Dallara/Honda/Firestone entry will feature this white ‘N gold paint scheme. Hmm? Why does the “Handle” BSA make me think of a long forgotten Motorcycle? ALL TIMES PACIFIC – ALWAYS CHECK YOUR LOCAL LISTINGS! And yeah, its only practice, so I don’t know whose getting the proverbial “Tow” around the Speedway, etc, as SHOCKING! Scott Dixon has been the Fastest Man on track the last two days... Although I have to say ‘TAG, nee Alex Tagliani has been looking good, especially whilst fighting a lingering case of Bronchitis; and how ‘bout that Hideki Mutoh, eh?